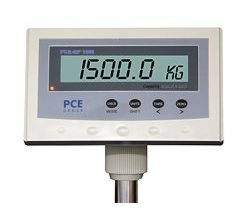 With the PCE-SW series floor scale, weights can be measured directly on a load platform or in the warehouse. 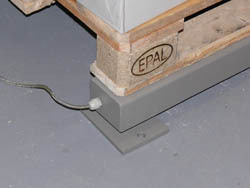 The weigh bars are connected by a cable, which allows to choose the suitable distance (up to 3 meters) between the bars. So weighing of the wide loads is very convenient. 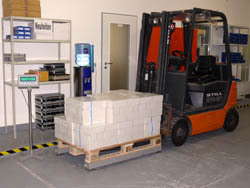 This scale does not require bringing the pallet to the scale, it can be taken to the pallet that needs to be weighed. 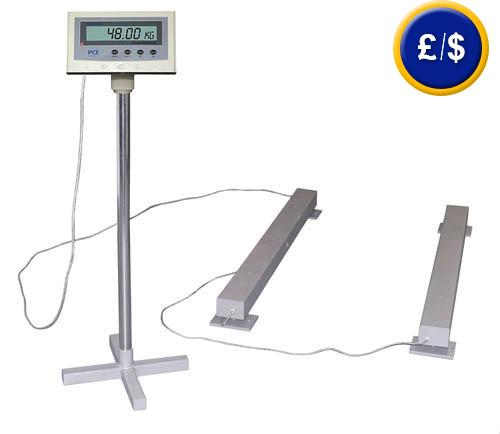 WIth this scale you will weigh things easily and with total control. The floor scale is powered by either a 230V mains adaptor or an internal rechargeable battery. Its automatic calibration function allows quick validation in situ using a calibration weight, which is not included with the scale. It can be transported easily from one location to another. The display can be detached and mounted on a tripod or placed on a table. This link shows and overview of all the available scales and balances. The display of the floor scale. 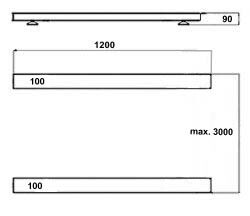 Dimensions of the floor scale. Operating conditions 0 to 40°C/10 to 80% r.h.
Software is in German and includes RS-232 cable. It allows the transmission of data to a computer. Data can also be exported to other software such as MS Excel. If you want to transfer data to a portable computer, you will need this adaptor to allow you to connect the RS-232 cable, which comes with the software, to USB port.